Address resolution using ARP is accomplished through the exchange of messages between the source device seeking to perform the resolution, and the destination device that responds to it. As with other protocols, a special message format is used containing the information required for each step of the resolution process. ARP messages use a relatively simple format. It includes a field describing the type of message (its operational code or opcode) and information on both layer two and layer three addresses. In order to support addresses that may be of varying length, the format specifies the type of protocol used at both layer two and layer three and the length of addresses used at each of these layers. It then includes space for all four of the address combinations we saw in the previous topic. 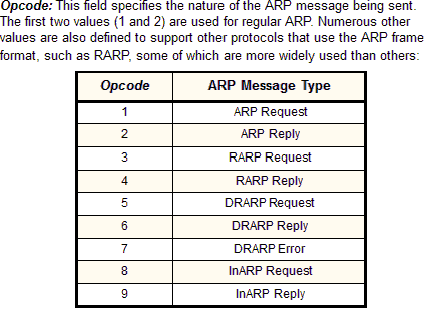 The format used for ARP messages is described fully in Table 42, and illustrated in Figure 49. Protocol Type: This field is the complement of the Hardware Type field, specifying the type of layer three addresses used in the message. For IPv4 addresses, this value is 2048 (0800 hex), which corresponds to the EtherType code for the Internet Protocol. Hardware Address Length: Specifies how long hardware addresses are in this message. For Ethernet or other networks using IEEE 802 MAC addresses, the value is 6. Protocol Address Length: Again, the complement of the preceding field; specifies how long protocol (layer three) addresses are in this message. For IP(v4) addresses this value is of course 4. Sender Hardware Address: The hardware (layer two) address of the device sending this message (which is the IP datagram source device on a request, and the IP datagram destination on a reply, as discussed in the topic on ARP operation). Sender Protocol Address: The IP address of the device sending this message. Target Protocol Address: The IP address of the device this message is being sent to. 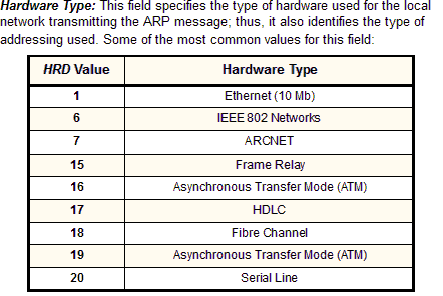 The ARP message format is designed to accommodate layer two and layer three addresses of various sizes. This diagram shows the most common implementation, which uses 32 bits for the layer three (Protocol) addresses, and 48 bits for the layer two hardware addresses. These numbers of course correspond to the address sizes of the Internet Protocol version 4 and IEEE 802 MAC addresses, used by Ethernet. After the ARP message has been composed it is passed down to the data link layer for transmission. The entire contents of the message becomes the payload for the message actually sent on the network, such as an Ethernet frame. Note that the total size of the ARP message is variable, since the address fields are of variable length. Normally, though, these messages are quite small: for example, they are only 28 bytes for a network carrying IPv4 datagrams in IEEE 802 MAC addresses.